I know that I am exhausted so I can only imagine what the new Duke and Duchess of Cambridge are feeling. See, they are just like us. Ok, so the Red Room has real gold in it…but they have to still take the family pictures. These are by famed photographer Hugo Burnand and simply stunning! This is the sermon – OMG This is so beautiful and I think worthy of every couple reading it. Catherine Middleton’s Wedding Dress has been designed by Sarah Burton at Alexander McQueen.It’s a gorgeous ivory and white silk gazar and lace applique handmade by Royal School of Needlework at Hampton Court Palace. The Royal School of Needlework (RSN), based at Hampton Court Palace, assisted the Alexander McQueen team in accurately cutting out the delicate motifs from the lace fabrics and positioning the lace motifs with precision into the new design. The lace motifs were pinned, ‘framed up’ and applied with stab stitching every two to three millimetres around each lace motif. The workers washed their hands every thirty minutes to keep the lace and threads pristine, and the needles were renewed every three hours, to keep them sharp and clean. A tourmaline and diamond pendant and matching earrings have been designed and made for Mrs. Carole Middleton. Two gold stick pins, one with a single gold acorn at the head and the other with an oak leaf, are also worn respectively by the Father of the Bride, Mr. Michael Middleton, and the Bride’s brother, Mr. James Middleton. The Bridesmaids’ dresses have been created using the same fabrics as the Bride’s dress. The ballerina-length, full, box pleated skirt gives the dresses a sculptural quality, with the layering of ivory over white satin gazar adding depth of colour. They have all been hand-finished with delicate English Cluny lace, which is visible under the skirts, and four layers of net underskirt. The puff sleeves and neckline are trimmed with the same English lace as the Bride’s underskirt. The backs have been finished with the same button detail. My heart is pounding because there is less than 24 hours until I marry the man of my dreams…my true Prince Charming William. I have butterflies the size of birds and am terrified of flubbing my vows or god forbid crying as I walk down the aisle messing up my makeup. I must say that I’ve just heard that William’s brother Harry, his date Chelsea who I like, is planning a change of dress. I don’t know if that is proper. I’m not jealous by any means – my dress(s) are simply gorgeous; I just don’t think I would have done that if the rolls were reverse. There are just so many little things I don’t know if they are done and it’s really getting late. I’m having a family dinner and William is going to be with his father and brother. I can’t believe that I’m getting married in the morning!! Honestly, I can’t thank you enough for keeping me calm, all your wonderful vendor recommendations and for simply being someone I felt comfortable with. Wish you were coming but I realize you have other brides to help. Thank you very much my dear Fairy Godmother. Today I sign off as Kate…tomorrow I’ll be Catherine. I’m really excited for you. 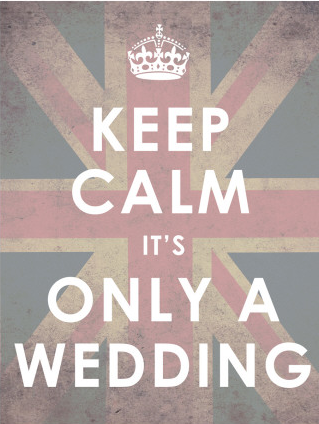 Did you know there is another Kate getting married in the morning as well?? Of course you did. Let me remind you to breathe! I know it may sound simple but when you want perfection on your wedding day there are times when you simply forget to Breathe. You will be a beautiful bride! No matter if you think you should have lost an extra 5 or 50 lbs, if there is a zit that appears or if you get a run in your stockings…YOU WILL BE BEAUTIFUL. No one will remember the small things; they will only remember your smile, your joy, your happiness on this day. You can’t worry about what others will wear (even though I think a guest changing is a bit tacky!). You are the star of this day and all eyes will be on you. Nothing will take away from your bridal glow. Tears of joy…I don’t know many people who wouldn’t think it sweet if you shed a tear or two. Now, a full-on gut-wrenching sob…that might be a problem. If that should happen, stop take a moment, gather your self, take a deep breath and if you think it just nerves, don’ worry – proceed. IF however you think you’re marrying into the wrong family, there is absolutely nothing wrong with postponing the start of your ceremony or even canceling it. Don’t worry if you’ve spent $20 thousand or $1 million. You must be happy. Better to end it now then spend years of unhappiness. So tonight what should you do? Go and enjoy dinner with your family. They will be your support and keep you grounded no matter what happens in the future. Do limit your drinking, as alcohol will cause you to bloat and have puffy eyes. So not a good look no matter how much make-up you have. Then take a bath and try to rest. I know you’re excited and you should be. You’re a bride. So off you go rest and wake up refreshed, ready for a full day of fun. Here’s wishing you tons of happiness, years of love and laughter. 1 – We know you’ve dated for 7 years but do you really know this man? The same guy that doesn’t pick up his socks or put the seat down MAY one day be King and you…the Queen. Talk about a 24X7 day job. No really, how cool is that?! 2 – What if you trip as you get out of the car? I mean can you imagine all eyes on you and you trip and fall, possibly chipping a tooth? Was this a concern and why you picked Westminster – no stairs? 3 – It’s bad enough when he has a middle name…when he has 4 or 5 and none of them a last name, like “Jones” or “Smith” how can you keep them straight? 4 – Talk about pressure of the ‘first kiss’. No dribble, not too long and none of the funny business of inhaling her face in. 5 –Keeping it white until after your official photo. That means no last-minute glasses of wine to calm your nerves (I’d just do a quick scotch straight down), no touching up of red nail varnish and truly stay away from any baby because, no matter how cute, baby puke no matter how royal, stains. You have the Ring+Prince...Now, be happy! 1 – Kate step out in a dress that would make the Queen blush. Hey, as long as your shoulders are covered and not too much cleavage, I’d rock those legs Kate! 2 – As you recite all 400 of his names, sneak in your private pet name for him. Even if it’s a whisper and what’s one more name right? More, it will probably make him giggle and we want to see Wills blush!! 3 – Do the famous “Dip-Kiss” when you get back to Buckingham Palace. You know the one from the end of WWII. It’s your stage and hopefully the one and only time you’ll have people looking down your throat while you kiss, so make it worth their while. Give her a right proper smooch Wills!! 4 – Change 4 times and have your last party frock, be one that you’ve designed yourself. Show people that you are more than “Waity-Katie” and a former glorified sales girl, but someone with a proper head on your shoulders and a true eye for style. Then after your honeymoon, open your own bridal line. It would truly be “From one Princess to another” OR design one for Disney Weddings. I hear they are looking for a new Princess to create a movie for. 5 – TRASH THE DRESS. While I hate this concept – truly, I’d love to see you take it back to your village where you and the Prince live and really give it a good throw around. What are they going to say to you – you have the ring, the new title and the Prince? I’d say …you’re good. Most of all, as someone who attended Oxford and actually was lucky enough to meet Prince Charles (quite the charmer) I can only imagine what you must be feeling. You’re honestly much more woman than most and good for you. Just keep your head on straight, your face forward, don’t loose your sense of self (or humor) and fun and if William gets out of hand…just tell his grandmother. She’ll put him straight away. I’ve been obsessed with three English brands since my days at University at Oxford. 1 – Lush – Thank GOD they finally came across the pond. My luggage used to weigh a ton with all the bath bombs! I’m THRILLED that all three of my favorite brands are here. 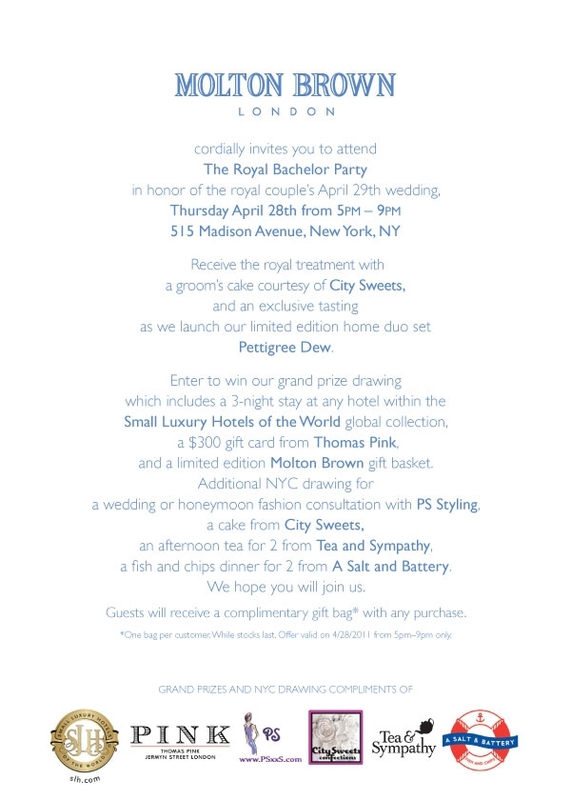 I’m even MORE excited that Molton Brown is hosting not one but two parties this week for the Royal Wedding. Like every good thing, you start with the Bachelor Party at their Madison Avenue Store. Looks like some great goodies and chances to win some great products. 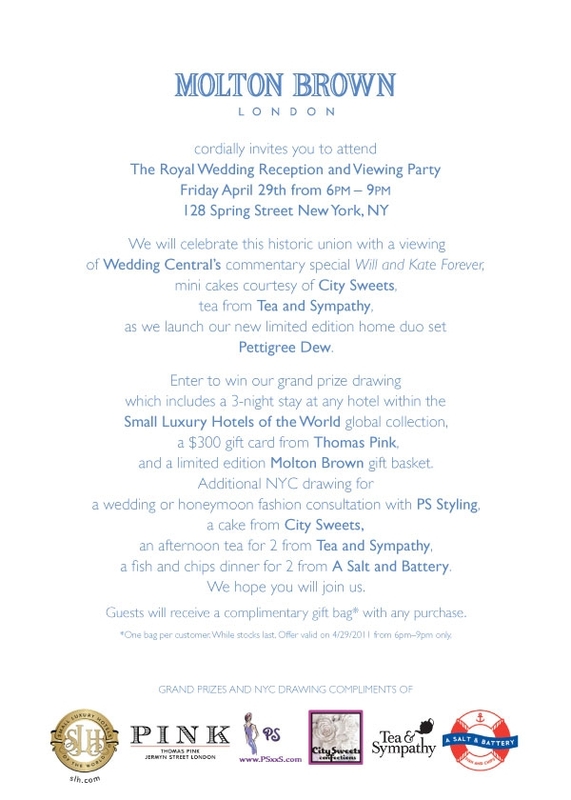 Since you didn’t get an invitation to the Royal After-party, why not head down to their Soho Shop for more fun. I know what will everyone in the wedding world do after Friday and of course all the ‘should have, could have’ commentary? Do I hear…baby in the works….that’s an entirely other blog.